Supermassive black holes are generally stationary objects, sitting at the centers of most galaxies. However, using data from NASA's Chandra X-ray Observatory and other telescopes, astronomers recently hunted down what could be a supermassive black hole that may be on the move. This possible renegade black hole, which contains about 160 million times the mass of our Sun, is located in an elliptical galaxy about 3.9 billion light years from Earth. Astronomers are interested in these moving supermassive black holes because they may reveal more about the properties of these enigmatic objects. This black hole may have "recoiled," in the terminology used by scientists, when two smaller supermassive black holes collided and merged to form an even larger one. At the same time, this collision would have generated gravitational waves that emitted more strongly in one direction than others. This newly formed black hole could have received a kick in the opposite direction of those stronger gravitational waves. This kick would have pushed the black hole out of the galaxy's center, as depicted in the artist's illustration. The strength of the kick depends on the rate and direction of spin of the two smaller black holes before they merge. Therefore, information about these important but elusive properties can be obtained by studying the speed of recoiling black holes. Astronomers found this recoiling black hole candidate by sifting through X-ray and optical data for thousands of galaxies. First, they used Chandra observations to select galaxies that contain a bright X-ray source and were observed as part of the Sloan Digital Sky Survey (SDSS). Bright X-ray emission is a common feature of supermassive black holes that are rapidly growing. Next, the researchers looked to see if Hubble Space Telescope observations of these X-ray bright galaxies revealed two peaks near their center in the optical image. These two peaks might show that a pair of supermassive black holes is present or that a recoiling black hole has moved away from the cluster of stars in the center of the galaxy. If those criteria were met, then the astronomers examined the SDSS spectra, which show how the amount of optical light varies with wavelength. If the researchers found telltale signatures in the spectra indicative of the presence of a supermassive black hole, they followed up with an even closer examination of those galaxies. After all of this searching, a good candidate for a recoiling black hole was discovered. The left image in the inset shown above is from the Hubble data, which shows two bright points near the middle of the galaxy. One of them is located at the center of the galaxy and the other is located about 3,000 light years away from the center. 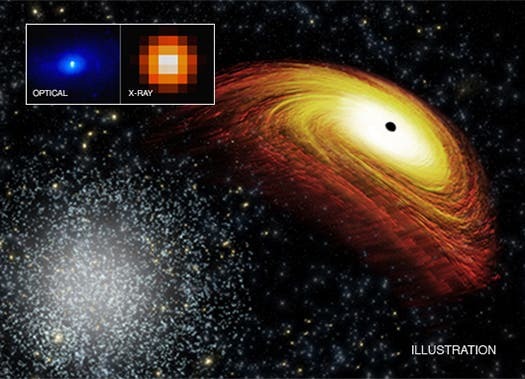 The latter source shows the properties of a growing supermassive black hole and its position matches that of a bright X-ray source detected with Chandra (right image in inset). Using data from the SDSS and the Keck telescope in Hawaii, the team determined that the growing black hole located near, but visibly offset from, the center of the galaxy has a velocity that is different from the galaxy. These properties suggest that this source may be a recoiling supermassive black hole. The host galaxy of the possible recoiling black hole also shows some evidence of disturbance in its outer regions, which is an indication that a merger between two galaxies occurred in the relatively recent past. Since supermassive black hole mergers are thought to occur when their host galaxies merge, this information supports the idea of a recoiling black hole in the system. Moreover, stars are forming at a high rate in the galaxy, at several hundred times the mass of the Sun per year. This agrees with computer simulations, which predict that star formation rates may be enhanced for merging galaxies particularly those containing recoiling black holes. Another possible explanation for the data is that two supermassive black holes are located in the center of the galaxy but one of them is not producing detectable radiation because it is growing too slowly. The researchers favor the recoiling black hole explanation, but more data are needed to strengthen their case. NASA: "Black Holes are Dark Matter Concentrators"
NASA/ESA: 'Warping Spacetime' –"Gravitational Fields of the Most Enormous Structures in the Cosmos Bound Together By Dark Matter"